1. How did you get in to swimming, was it through school, a local swimming club? It’s a crazy story really. We were taking a family holiday along the Thames on a barge when I was 7 years of age and my dad made me wear a life jacket all week. It got to the weekend and I forgot to put my lifejacket on. My brother was chasing me around the boat and the next thing I knew I was in the water holding onto the barge. Fortunately, my dad fished me out and we joined swimming lessons at a local club the following week. 2. At what moment did you realise you wanted to make a career from swimming professionally? Was there a particular inspiration for you? Definitely. In 1988 we had a masterclass session in Liverpool from the 100m Butterfly Olympic medallist Andrew Jamieson. 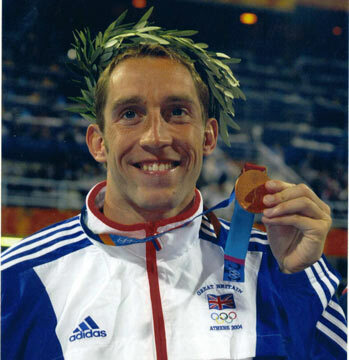 His mum was my coach at the time and I remember thinking “that’s what I want to do”: stand on the rostrum for Great Britain and win a medal. There were many times I doubted it would ever happen but you got to keep plugging away! 3. You retired at the age of 27, did you struggle with the transition to a career outside of elite sport? What advice would you give to up and coming athletes about developing their skills and looking ahead to the future? Of course it was incredibly difficult adjusting. Athletes are focussed, driven and to a degree selfish in the pursuit of their goal. I went for a few job interviews in banking and real estate but soon decided I needed to be my own boss. I set up my business in 2006 and never really looked back. Entrepreneurs have lots in common with athletes and I love the challenge of growing the business. Whatever route you take you have to be passionate about whatever you’re doing or the grind will hurt you! 4. As we know you have now set up the swim school, Total swimming, with your former training partner Adrian Turner. What inspired you to do this project? Half the kids in the UK can’t swim and we felt we had the ability to do something about it. It’s a life skill and 400 kids drown every year and that’s our motivation. It’s also the best health and fitness past time you can do so we love it. 5. As our official ambassador, how do you think RAPs can affect the industry? The success and longevity of the Register of Exercise Professionals (REPs) has really shown what can be achieved in order to professionalise an industry. I hope that RAPs will have a similar effect on the aquatic industry as REPs does on the fitness industry. I believe that ensuring there is quality and professionalism throughout this industry is a must, and it’s fantastic news that the Register of Aquatic Professionals is actively addressing this major issue. 6. Why did you want your swim school to join RAPs? It’s important that all of our staff get as much professional development as possible and can benchmark themselves against the industry and identify areas of improvement. 7. How do you think we can engage more people in the sport? It’s the biggest participation sport in the country with over 3 million regular swimmers a week. I think what we need to focus on is getting kids in the water as early as possible and this will help with their lifelong participation.